Does disruptive thinking leave you feeling threatened? Disruptive behaviour seeks to put a kink in market performance; a shift in how it operates that quickly escalates. It challenges our very idea of how things work. But as seen with recent high profile examples, do ‘innovators’ have to go further and confront rules and overcome competitor roadblocks to achieve the disruption they seek? Well, it can be described as a process whereby a product or service has an initial role at the bottom of a market but then grows rapidly to displace established behaviour. It can also be defined as any approach that fundamentally changes the existing supply or demand framework of an industry. The ambition is to either create new markets or enable scaling in an established area. Amazon and its online commerce platform have transformed the way many people shop. Other now famous innovators had to confront laws, ethics and even barriers put in place by competitors en route to disruption. Uber is the beautiful example here – claiming that they were a technology business and not a transport group, thereby avoiding the need for driver employees. In doing so, they created employment opportunity for thousands of drivers. They recently lost that ethical battle. The reaction from the black cab community in London sought to restore the status quo. Legal barriers were erected citing historical concerns about Uber’s ‘approach and conduct [which] demonstrate a lack of corporate responsibility in relation to a number of issues which have potential public safety and security implications’. In parallel, there was a public outcry – they had created an on-demand expectation upon which many now rely - 3.5 million in London alone. Ultimately, when innovation invades our own personal space, isn’t it natural that we would construct barriers, and mobilise allies to protect the status quo and so stifle innovation? 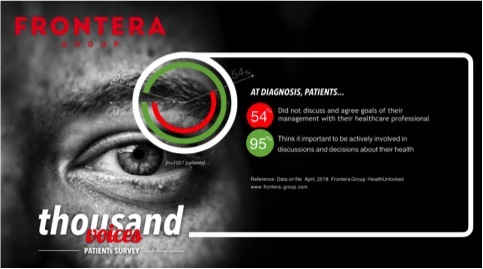 The Thousand Patient Study (Frontera Group, April 2018) revealed that the majority of patients were not involved in setting goals and expectations of management. Yet 95% of patients believe they should be. Yet the majority of industry engagement approaches continue to focus on the professional, with the patient remaining a peripheral stakeholder, at best. In addition, we know that by better engaging patients directly, we’re able to increase knowledge/capability and confidence. In doing so, evidence shows that this increases health outcomes. Too often, procurement departments focus on producing short-term savings, rather than identifying innovations that can transform care and lead to more efficient services. Identifying the most pressing problems and looking for change solutions is rarely anyone’s day job. Leadership with oversight of the role of innovation could make a fundamental difference. It concluded that ‘until these issues are acknowledged and addressed, the NHS is unlikely to become the cutting-edge system we have long wished to see’. So, at what point does market demand for progress overpower the barriers that can arise to impede change? What will it take for all healthcare stakeholders to embrace what may well be necessary to cope with the demands of addressing an ageing population? Who will take the lead as we look to shift attitudes to confront population health together? What will innovation take in healthcare? The same fundamental issues may apply: challenging current ‘rules’ could be an inevitable need to accelerate disruption in healthcare; tasking the procurement role to seek out more long-term value of change; competitors driven by self-interest will maintain the status quo until they themselves are forced to change through a shift in customer expectation. We live in interesting times. Change, like death and taxes, is inevitable. The speed of change is the question and Communiqué could give us an indication of where we are on that path to change. This year, will we reward true innovation or will outstanding execution of familiar thinking be the big winner on the night?